She comes in almost always late and doesn’t even hit the ground running—instead, she goes out to have early lunch, leaving you to answer her phone that never stops ringing. People keep on asking you where to find her, and when she does stay put in her cubicle, it doesn’t even seem like she does anything to contribute to the team. Worse, she’s always the first one out the door at the end of every shift. Every hard-working woman has had to deal with someone like that at some point in her career, and yes, it can be very frustrating, but before you snap and “accidentally” drop a heavy-duty stapler on her high-heeled foot, pause and think about where exactly the frustration is coming from. Do her actions actually matter? How much of your processes does she affect? It’s important to know where exactly your processes falter and if her actions cause it. 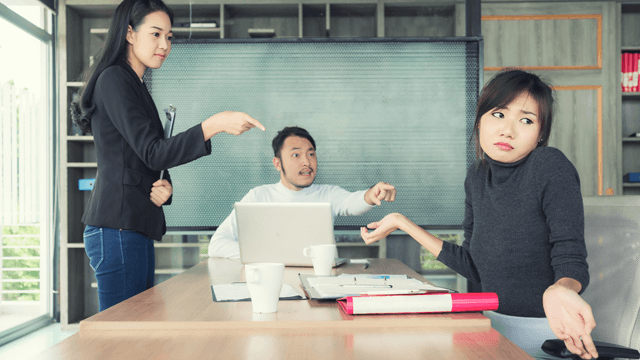 It’s so easy to blame your officemate for everything wrong that’s going on, so be conscious of your irritation and first see if any of it is professionally valid. Once you take note of the lapses, find ways on how you can fix them; if you can skip going through her altogether, then why not? Approach her in such a way that you’re open to her input. Don’t go charging in and blaming every single problem on her. Maybe she’s taking care of a relative at home, which is why she comes to work late and goes home early. Maybe she is working hard and she actually has her hands full, which is why she can’t process your stuff right away. An open and honest dialogue can help you both understand each other’s needs and improve your previous workflow. If in the end, there’s really no legit reason why your officemate is slacking off other from the fact that she’s just plain lazy or she doesn’t like her job, then talk to a person who’s in the position to make a difference. Don’t be sumbungera, and don’t try to make yourself look like the martyr or the hero. Instead, be honest about wanting to improve your team’s cohesion, and explain that including your officemate in the loop is a good way to do it. It’s so easy to fall into the pit of complacency when an officemate is seemingly chill in it. Don’t get distracted and stay focused on your job. Don't worry; the scales will eventually balance out.